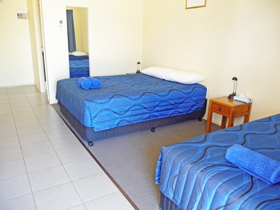 Moura Motel provides modern, quality accommodation for travellers and workers in the local Banana Shire area. Our family suite offers plenty of space and all the comforts of home, including well-equipped kitchen, lounge area and very comfortable Sleepmaker mattresses. All bathrooms are fitted with hair dryers and loads of hot water. The wide verandahs connect rooms to parking, guest laundry and barbecue area. For our disabled patrons we have designed a room with all the approved features to make your stay trouble-free. 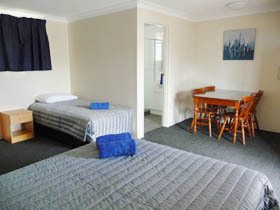 All rooms have free WiFi internet and flat screen TVsA. A deluxe contemporary motel room containing one Queen sized bed. 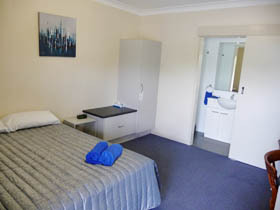 Full tea and coffee making facilities, toaster, ironing board & iron are included in this air conditioned room. 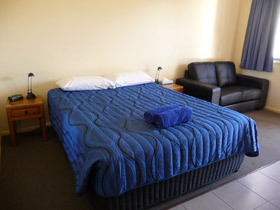 A deluxe contemporary motel room containing one Queen sized bed plus a single bed. Full tea and coffee making facilities, toaster, ironing board & iron are included in this air conditioned room. Room contains one Queen sized bed. 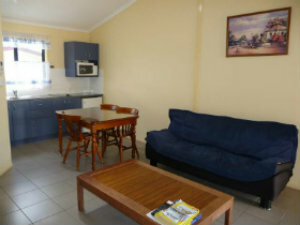 Full tea and coffee making facilities, toaster are included in this air conditioned room. Room contains one Queen sized bed and two single beds. Full tea and coffee making facilities, toaster are included in this air conditioned room. Self contained apartment with 2 bedrooms (queen bed and two single beds) one bathroom, separate lounge/dining area including kitchenette. The lounge room contains a divan which enables the apartment to sleep a maximum of 5 people. An additional charge applies for the use of the divan.